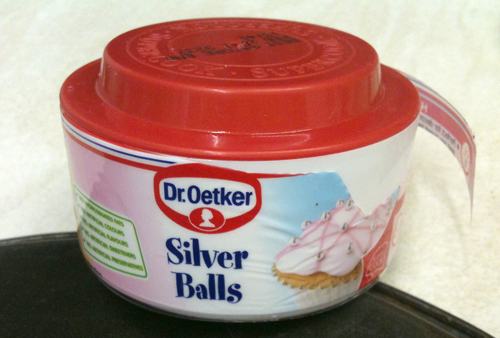 We were talking about traditional British celebratory cakes – proper rich fruit cakes with home-made almond paste, white royal icing and piped rosettes with silver dragées – and I was disappointed to find that confectionery suppliers in the UK are dumbing down: apparently they aren’t ‘dragées’ at all any more, but ‘silver balls’. Why are we simplifying things when we have perfectly good and accurate words? A ‘silver ball’ could be any size and made of anything. A ‘silver dragée’ is far more precisely defined. It’s a word I learned as a toddler, I think, when Mum made shopping lists for cake ingredients. A word I haven’t used in decades, but which came back to me when the context demanded. Almost all children delight in language and love complicated and unusual words: just think how they’ll memorises all those dinosaur names because they want to, not because they have to. I used to teach English to Spanish children and they absolutely lapped up complex vocabulary. When we talked about animals, they didn’t want words like “cow” and “horse”, they wanted to know the English for ‘skunk’, ‘weasel’ and ‘ferret’, and they weren’t satisfied with inadequate substitutes or generalities. I remember my own delight when I saw my first hoopoe one Sunday morning walking the dog with my father in Hainault Forest – delight both in seeing the bird and learning the word – and the similar joy when I learned the Spanish word abubilla. Knowing the right word and being able to use it correctly is a skill that prevents misunderstandings. I realise and accept that language changes and evolves, but by using only generic words we are surely doing our part to impoverish it.